Castle Wall™ and Castle Spire® Blue Holly: Vigorous new varieties of blue holly with dark glossy leaves and compact pyramidal forms. 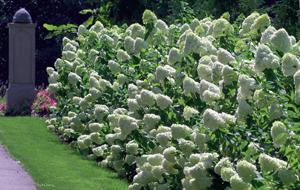 Limelight Hardy Hydrangea: Produces bright chartreuse blooms in mid-summer that change to deep rich pink in the fall. Fine Line® Buckthorn: Feathery upright foliage perfect for privacy hedges, accent plants, and patio containers. Show Off™ Forsythia: Compact new variety that doesn't need heavy pruning yet produces spectacular blooms year after year. 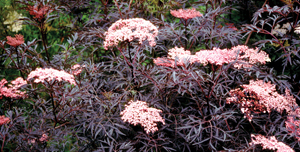 Black Lace™ Elderberry: Intense purple-black foliage with finely cut leaves – similar in look to a Japanese maple. If your mind’s set on a boxwood hedge, plant new Proven Winners North Star™ Boxwood. It is easy to maintain as a compact, dense globe with shiny dark green leaves that need little pruning and is cold hardy. Or how about adding a showy, all-summer color with our Proven Winners Home Run® rose It’s the first true-red landscaping rose that blooms continuously and is disease-resistant. Both are easy care shrubs that produce carefree hedges.